the small bones of the middle ear; they are articulated to form a chain for the transmission of sound from the tympanic membrane to the oval window. 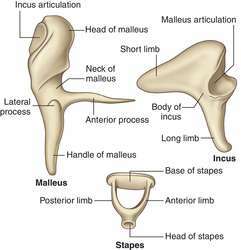 the malleus, the incus, and the stapes, three small bones in the middle ear that articulate with each other. As the tympanic membrane vibrates, it transmits sound waves through the ossicles to the cochlea. The 3 diminutive bones of the middle ear. The malleus is attached to the inner face of the tympanic membrane at the manubrium and articulates at its head with the body of the incus; the incus in turn articulates at its lenticular process with the head of the stapes; the stapes is attached at its base by a ligamentous ring to the oval window of the vestibule. Sound waves channelled though the external acoustic canal (auditory duct) to the tympanic membrane are amplified by the auditory ossicles. The vibrations received at the oval window are passed down the cochlea; the relative movement of the basilar and tectorial membranes leads to deflection of the stereocilia of the hair cells in the organ of Corti, which generates an influx of K+ ions and production of electrical signals that travel via the cochlear nerve to the auditory complex. Synonym(s): ossicula auditus [TA] , ear bones. The chain of three tiny bone in the middle ear which acts as an impedance transformer, efficiently coupling the relatively large low-impedance movement of the ear drum to the smaller, high-impedance movement of the fluid in the cochlea of the inner ear. Small bones of middle ear articulated to form a chain for the transmission of sound from the tympanic membrane to the oval window. The STL file of the auditory ossicle was imported; the collecting ball was moved to enclose the short process of malleus and all-point clouds were collected in the ball. These adaptations include heavy auditory ossicles with loose ligamentar attachments, large tympanic membranes and an increased bullar volume (Burda et al. For example, modification of the bones of the jaw in fish resulted in the development of auditory ossicles and a newly formed middle ear in what eventually became humans.